On January 4th, my host family and I visited the Daio Wasabi Farm in the Nagano prefecture. The farm is the largest in Japan covering roughly 150 thousand square meters. Although it is primarily a functional farm, tons of [mostly Japanese] tourists come for a nice walk around the fields. It is also the home of the very famous wasabi ice-cream which I believe is honestly not that good. They recently opened their own museum for the farm’s 100 year anniversary, from which I have taken a lot of the information given below, as it has a small English section. Wasabi, which is written 山葵 in Kanji, or often just わさび in Hiragana, you could also get all fancy with the scientific name “wasabi a japonica”. If you don’t want to get fancy, the common name is also just “Japanese horseradish”. The literal translation for wasabi is mountain hollyhock. Wasabi is one of the most common herbs used in Japanese cuisine. No part of it is wasted, as one can use it from the leaves all the way to the white roots. You probably now what it is, and can picture what it looks like, if not, it’s that small green paste that you probably ignore in your take-out sushi. There are a few types of raw wasabi, such as sawa wasabi, hatake wasabi [also known as riku wasabi], or horseradish. The one cultivated at the Daio Farm is sawa wasabi. There are quite a few different cultivation styles, and at this farm they use a flat-type cultivation style. The water temperature has to be stable throughout the year, so there are a lot of trees around the farm to avoid direct sunlight in the middle of summer. Wasabi has a very long history in Japan. The oldest records of wasabi are from the 7th century. Historically, wasabi was used as medicine, and has been established as a condiment in the Muromachi era [室町時代, 14th to 16th century], and since the Edo era [江戸時代, 17th to 19th century] it has been known in conjunction with sushi or soba. The Daio Wasabi developed wasabi fields with the rich clean spring water in alluvial fan in 1915. 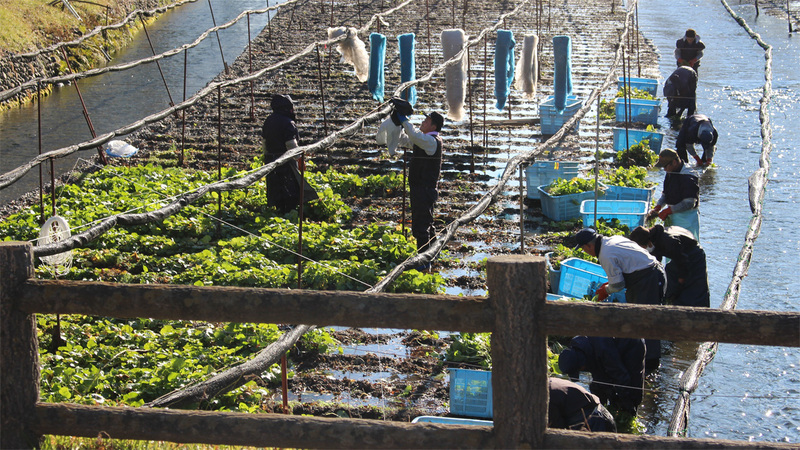 It took 20 years to complete the base of the field, and, after the war, the started planting and growing wasabi. They built a large-scale retail store and started direct sales business. The farms annual harvest is around 130t, which is 5% of the nations total. The name comes from the shrine located at the center of the farm. Nowadays, it is also a tourist facility. Highlights of the farm include a beautiful water wheel, the Daio Shinto Shrine and the suspension bridge of happiness. You will find a lot of “very unique” bridge names here, such as the bridge of dreams. You can walk around the farm and see most of the fields in around 30 minutes. The farm has a very big gift shop. A VERY big gift shop. You can buy a lot of things, from fresh wasabi roots to wasabi chocolate and, sigh, the “great” wasabi ice-cream at the stall outside. The green stuffed teddy bears you can see on the right is a special edition of the mascot for the 100th anniversary. You can spend a lot of time here looking at all of the things, and then ending up buying a lot of things. A very common thing you see in Japan is Shichimi, which is a type of spice-mix including 7 spices, shichi [七] is Japanese for seven. This farm has a special version called Hachimi, [八, hachi, eight], including all of the regular spices [poppy seeds, sichuan pepper, hemp seed, seaweed, black pepper, citrus peel and chili pepper] and, of course, powdered wasabi. I’m sending one of these to a friend of mine who runs a very beautiful Japanese cooking blog, go and check it out. Here I’ll include a bunch of images from the field similar like I did with my trip to Nezame no Toko, as the friend I mentioned early told me yesterday that I don’t include enough images on here, so, here you go.